de Souza e Silva, A. (2019). Location-based Urban Mobile Apps in Rio de Janeiro: Towards a Model that Supports Perpetual Contact for Sustainable Mobilities. International Communication Association (ICA) conference. Washington, DC: May 24.
de Souza e Silva, A., & Damasceno, C. S. (2018). The history of mobile telephony in Brazil: Privatization, regulation, and access. #AoIR2018, Association of Internet Researchers (AoIR) Annual Conference. Montréal, Canada: October 10-13. Farman, J., & de Souza e Silva, A. (2015). 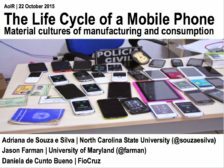 Mobile media origins: Rare earth minerals and the ecological impact of a mobile device. Society for Social Studies of Sciences 4S 40th Annual Meeting. Denver, CO: November 14.
de Souza e Silva, A., & Froes, I. (2013). 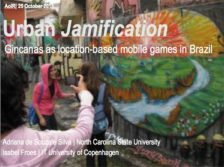 Urban jamification: Gincanas as location-based mobile games in Brazil. Association of Internet Researchers (AoIR) 14.0 Annual Conference. Denver, CO: October, 24-27.
de Souza e Silva, A., & Froes, I. (2013). Urban jamification: Gincanas as location-based mobile games in Brazil. 6th Digital Games Research Association (DIGRA) Conference. Atlanta, GA: August, 26-29. Shklovski, I., & de Souza e Silva, A. (2012). An urban encounter: Realizing global connectedness through local urban play. Association of Internet Researchers (AoIR) 13.0 Annual Conference. Salford, UK: October, 18-21.
de Souza e Silva, A. (2011). The dawn of location-based services in Brazil. Association of Internet Researchers (AoIR) 12.0 Annual Conference. Seattle, WA: October, 10-13.
de Souza e Silva, A., & Gordon, E. (2010). 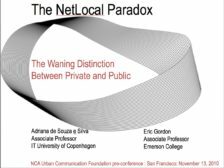 The Net-Local paradox: The waning distinction between private and public. NCA Urban Communication Foundation pre-conference. Chicago, IL: November 13.
de Souza e Silva, A., & Frith, J. (2010). 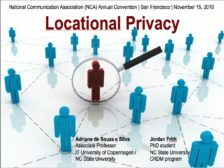 Locational privacy: Control and personalization in location-based social networks. National Communication Association (NCA) conference, San Francisco, CA: November 15.